Mother, son dances don't exist because they are creepy. Why do father, daughter dances exist. They are no less creepy than a mother, son dance. I thought the dance floor was the great equalizer? There is no race, no religion, no social hierarchy just dance. Was all the work of Kevin Bacon, Patrick Swayze and John Travolta for nothing?! They proved to us (thru their bell-bottomed moves) that anyone can dance and that we shouldn't have these exclusatory dances. Only fathers and daughters is just weird. I don't want to dance to Lady GaGa's "Disco Stick" with my dad. I don't want to dance to "My Eyes Adore You" with my dad. The father, daughter dance is just an excuse to take photos. So, just get all dressed up, go into the backyard and take some photos and save everyone the embarrassment of dancing to Dolly Parton's "I Will Always Love You" with your dad. No one wants to see that. 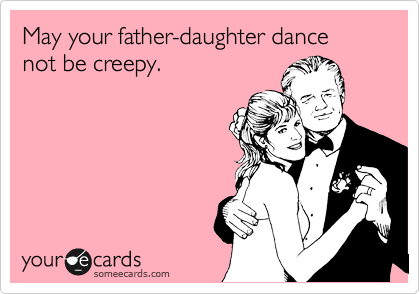 Keep in mind, you can dance with your dad and that is fine. But, if your child is exclusively dancing with her dad at an event that has a raffle for golf lessons and everyone is wearing crowns/tiaras then your child might be at a father, daughter dance.